Last week, tragedy struck the waters of Balikpapan Bay as an underwater pipeline transporting crude oil cracked and leaked oil into the ocean. The oil spill first occurred over the weekend at the beginning of the month and is now beginning to spread into the open ocean. Reports say that the oil slick has now spread across an area greater than the size of the city of Paris. The oil spill which took place in the East Kalimantan province is also said to be responsible for the deaths of five fishermen. According to Agence France-Presse (AFP), the men who died were on holiday and were fishing together. It is believed that they died in a fire sparked by workers who were trying to eliminate the oil spill by burning it off the water’s surface. The Indonesian government has declared a state of emergency because of the oil spill. Initially, the cause of the leak was unknown but state-owned oil and gas corporation, Pertamina has since admitted responsibility for the oil spill despite their initial denials. The Indonesian government however has placed the blame on a coal ship which they claim dropped anchor on the pipeline, causing it to crack. Indonesian police have already begun investigations, telling Indonesian media that they have questioned 22 people so far. The national police said that a criminal prosecution may arise from this incident. At the moment, the oil spill at the Balikpapan Bay has almost cleared up. The head of the environmental agency in Balikpapan, Suryanto told local media on Sunday that the cleaning efforts had reached 90 percent and that the remaining oil was still in the coastal areas. Aside from government efforts, Pertamina together with fellow oil companies, Chevron Indonesia and Petrosea were also involved in the cleaning efforts. Pertamina deployed 21 ships and 234 people to clean the bay. The coast of Balikpapan may return to familiar sights now but when the oil spill first occurred the towns by the bay were described as smelling like a “gas station” and were engulfed in smoke. While cleaning efforts are almost complete, some of the damage done to the environment could be irreversible. Initial effects of the oil spill have already reared its ugly head as locals reported the discovery of a dead Irrawady dolphin washed up on the coast near the oil spill. The dolphin is considered an endangered species and is protected under Indonesian law. According to the environment ministry, the oil covered over 13,000 hectares and has polluted 60 kilometres of coastal ecosystems, including mangrove wetlands and habitats of marine life. Aside from that, it is reported that thousands of people from Balikpapan have complained about health problems as a result of the oil spill. 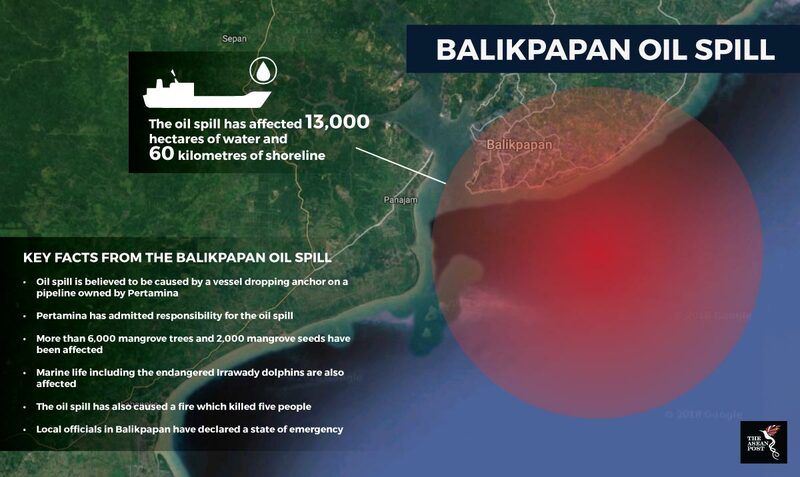 Balikpapan is one of Indonesia’s growing tourist destinations but with damaged wildlife and potential health risks from swimming in the water, the oil spill could harm Balikpapan’s tourism industry. Furthermore, the damaged ecosystem could severely affect the income of local fishermen. Almost 10 years ago, Australia witnessed one of the largest oil spills in its history. The communities in the surrounding Indonesian provinces were worst hit by the oil spill. 10 years later, the effects of that oil spill are still being felt till today, from health issues to loss off livelihood due to the destruction of seaweed farms. In 2016, 13,000 seaweed farmers launched a massive class-action suit demanding for compensation for the oil spill. This oil spill should serve as a lesson to Indonesia and Pertamina on what they should do to ensure the safety and livelihoods of citizens in the affected areas. Environmentalists have come out and criticised Pertamina and demanded that they take responsibility. Yudi Tobs from Coalition Against Oil Spills (KMPTM) pointed out that Pertamina was poor in their initial response to the oil spill. Pertamina denied that they were responsible and only claimed responsibility four days after. Four days is crucial in an oil spill and could have made a world of difference. The Indonesian government needs to hold Pertamina accountable and make sure that any costs for cleaning and recovery efforts should come out of their pockets rather than that of tax-payers. However, there could be a conflict of interest here since Pertamina is state-owned. Still, the Indonesian government needs to have the best interests of its people at heart.